Design your own toes with various nail design combinations from unlimited creativity stock in this Toe nail salon . Get the ultimate royalty treatment for your toes, Dress up toe and give them a gorgeous makeover. 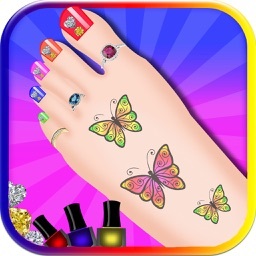 Have fun creating fabulous Nail designs in one of the amazing nail salon game. 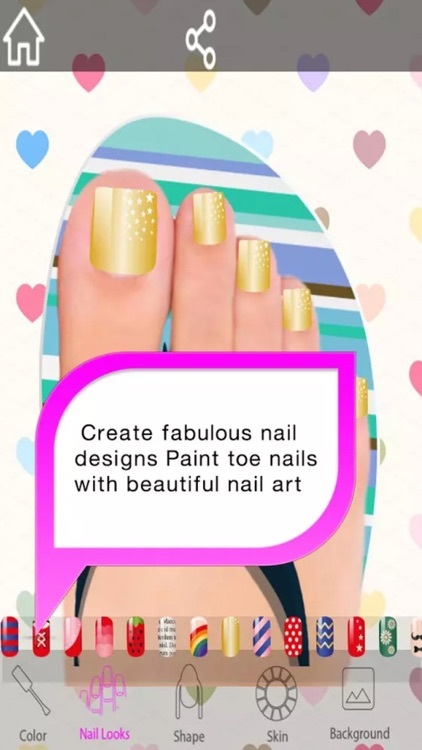 Become an expert nail artist while creating fashion pedicure designs with the best Toe Nail Salon – Foot Spa App for girls. Toe nail salon is the best Mobile Nail Artist to create fabulous Nail designs with multiple colors, patterns, and styles. Come to makeover and dress up in the Foot Spa to create one of a kind nail art, Try custom Nail looks or draw your own Nail design with Paint. An astonishing nail salon foot spa app to get a glamorous look of your feet with one touch pedicure. The Greatest fashion and nail game provides step by step process to create super cute nail designs and pedicures for stunning style at your fingertips with hundreds of fabulous colors, beauty patterns, and decals. Decorate your nails like a pro and perform fabulous toe nail makeover, thus achieving the looks of the most beautiful toe nails and just the perfect nail designs and patterns. Apply the astonishing colors, designs and styles on your nails to get glamorous nails look, click to take one touch foot spa for trendy foot look to get ready like a princess. Do your nail makeover by adding stickers or patterns and changing the shape of your toes. Painting nails have never been easier and more FUN! Try it now the loveliest pedicure salon game on the play store.